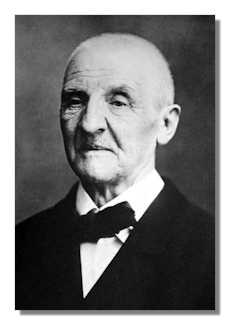 Bruckner's last two years were consumed with the creation of his transcendant ninth symphony. But his last great work was left unfinished. He was well aware of his limited time, and the last movement was substantially composed, at least in a first-draft form, but the ninth symphony was not completed before his death. He finished approximately 17 minutes of the last movement in full score, not just sketches. Given Bruckner's propensity for revision (even when not pressured by outside forces), it's likely that even that portion that exists would have been revisited had Bruckner lived long enough. Though a "version" of the ninth symphony, edited by Loewe, was published in 1903, the symphony was left unpublished in its authentic form until 1934 when an edition by Orel, a predecessor of Haas as the editor of the first editions published by the International Bruckner Society, was issued. The later Nowak edition is identical except for the correction of one or two misprints. Only one version of the last movement was extant at the time of Bruckner's death – largely because of all the time he'd spent revising the first and eighth symphonies during those last years. The incomplete last movement was not included in any of these published editions. The first performing version of the unfinished last movement was prepared by Carragan and published in 1984. Samale and Mazzuca completed a draft completion of the last movement in 1987. This edition has since been superseded by a second completion by Samale, Phillips, Mazzuca, and Cohrs, completed in 1992. William Carragan has been preparing a revision of his completion to include scholarship since the prior version which should be published soon. The last movement is grand, some would say bombastic, even by Bruckner standards. The symphony can be enjoyed in its unfinished state in a way that is perhaps similar to listening to Bach's Art of the Fugue. It certainly leads one to wonder how extensive the revision of the this movement would have been had Bruckner had a few more years to polish the finale. Of course, it is impossible to say for sure, especially considering the other "big" Bruckner symphonies that were written in full score prior to their first performance and hardly touched thereafter: the fifth, sixth, seventh, and of course the first three movements of the 9th. Few would suggest that these works are in need of revision. That Bruckner spent the last two years of his life on this music, and was working on it the day he died, is testimony to a determination to finish the ninth, his ultimate tribute to his religious conviction. The lowest priority among the performing versions is the earlier work by Nicola Samale and Giuseppe Mazzuca, which is the one recorded by Inbal and the Frankfurt Radio Symphony Orchestra for Teldec (4509-91446-2). This is because the Samale/Mazzuca completion has been superseded by a more refined completion by Samale, John Phillips, and Mazzuca, under the supervision of Gunnar Cohrs, and completed in 1992. This performing version has been recorded by Kurt Eichhorn and the Bruckner Orchester Linz on a two-disc set from Camerata (CM-275-276). In my opinion, the version truest to the Bruckner style is the 1984 completion by William Carragan, which has been recorded by Yoav Talmi and the Oslo Philharmonic Orchestra for Chandos (CHAN8468/9, reissued as CHAN7051). The recording is laid out on two CDs, the first covering the three movements Bruckner completed, the second contains performances of both the completion by Carragan and also Bruckner's original sketches for the last movement, so a direct comparison between the "original" and the Carragan completion can be made. In fact, both "completions", are surprisingly similar in most respects, which I take as an indication that Bruckner had nearly finished the movement when he died. If you are seeking only one "completed" ninth, this is probably the version to hear. Either completion should definitely be sampled (and auditioned several times to let it make a more seasoned impression).